Sketchbooks are perfect for practising, seeing ideas play out, or just to have fun without feeling the pressure. The latter is the main reason I work in my sketchbook. Unwrapping a large white canvas can feel very daunting, but painting in a little sketchbook that you can shut and hide away, feels a lot more secretive and expressive. I used to adore painting portraits and I stopped for some reason. I think it was because it was always quite difficult and required huge attention to detail. With my floral paintings I found I could relax and be more expressive with my paintbrush. So I've started with little hints of faces, and I'm loving the relaxed documentation of my thoughts. I've love to transfer some of these ideas into a final piece and eventually create a larger painting, but I'm afraid I don't have a vision for that yet. I'm going to keep working on the expressions and trying to pin down the skin tones and magic in a face. I wanted to share what I had so far, and know that a lot more portraits are in the pipeline. 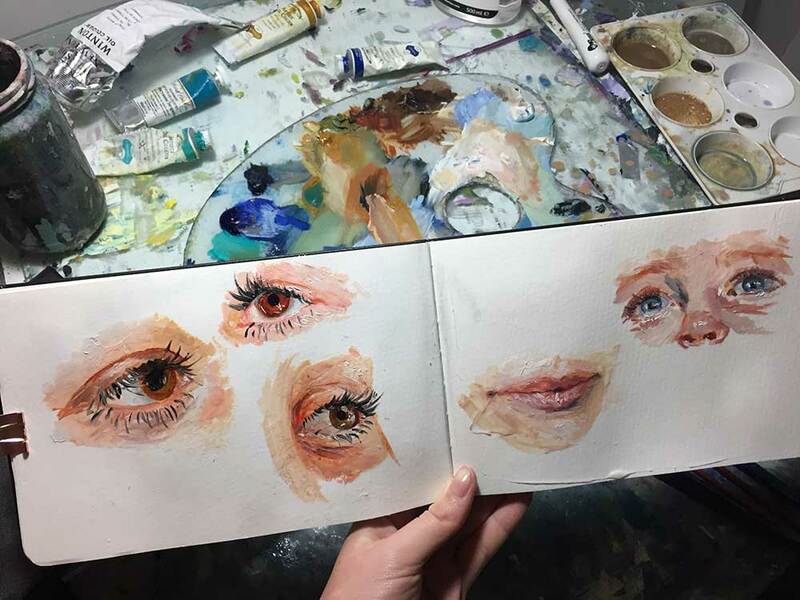 Have you ever tried drawing or painting a portrait? They're a lot more fun than you think. Try it! You can have all sorts of fun with colours. For now, you can keep up-to-date with my artwork on my Instagram here.